They picked up TWO Business Challenge trophies at last year’s Great Birmingham Run. And the running team at Lion Picture Framing Supplies is roaring to go in 2017. The company is entering 12 runners at the PKF Cooper Parry Business Challenge in the Simplyhealth Great Birmingham 10K on Sunday, April 30. And after catching the ‘running bug’, three of the Lion runners will also be taking part in the city’s first-ever Birmingham International Marathon on Sunday, October 15. 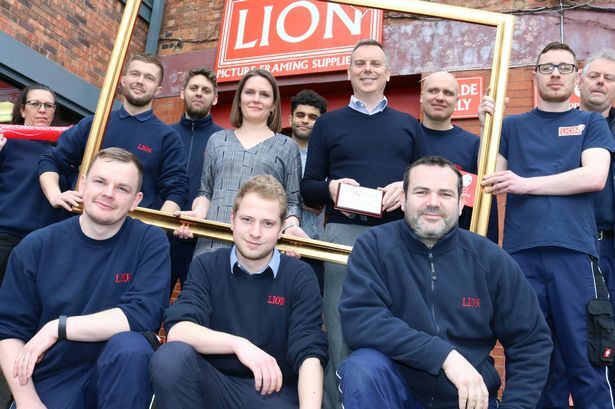 Bordesley-based Lion is one of the country’s biggest suppliers to the picture-framing industry and sells materials and tools in the UK and worldwide. The company took part in last year’s October half-marathon and won a plaque for finishing third in the Medium Business Men’s category, plus an additional plaque for having 12 or more runners taking part. The PKF Cooper Parry Business Challenge is open to small, medium and large businesses to compete in the Great Birmingham 10K or the Great Birmingham Run half marathon on Sunday, October 15 – the same day as the inaugural Birmingham International Marathon. Over 60 teams took part in last year’s Great Birmingham Run and 10K Business Challenges, from a variety of business sectors and sizes across the Midlands. “Straight after last year’s half marathon most people who took part said they wanted to take part again, and they wanted to do the 10K,” said Managing Director, Nicola Harrold, who will be leading the Lion team at the 10K. “Last year we raised for Birmingham Children’s Hospital Charity and we’re planning to do the same again this year. Nicola explained how taking part in the Great Run events provides a great boost for team spirit and staff connections. “In this business we have people who work in the warehouse and people who work in the offices. They don’t necessarily have that interaction and I think it broke a few barriers and had people talking to each other who wouldn’t normally,” she said. Nicola is one of the three Lion runners with the Birmingham International Marathon in her sights. “We’ve even been training while away at trade shows and took our running stuff to a show in Amsterdam!” added Nicola. Companies across the Midlands are invited to join Lion in entering the PKF Cooper Parry Business Challenge, which is open to small, medium and large businesses in men’s, women’s and mixed categories. Trophies will be handed to the fastest teams, while any business that enters 12 or more employees will receive an engraved plaque in the name of their fastest runner. The four fastest times posted by each business are accumulated to determine the winners.